A couple of minutes ago, in their final battle against England, West Indies were on the verge of losing their trophy. But, the last four balls changed it all. The last over turned the tables around for both the teams. Four sixes, and West Indies had the world at their feet! Doubtless, the match was much larger than life for England and West Indies. But, it can be the same for every person around the world who viewed it. Why? Because, this one match has taught us the most important lesson of our life. To finish strong! West Indies almost lost against England, but the key word here is : Almost. In cricket, either the last wicket or the last ball marks the end of a match. With life, it is very much the same. Until we breath our last, we do not die. We do not lose. We do not surrender. If you really, honestly and genuinely think that you are going to lose, like losing at that particular point is inevitable, then please do this: Fight with all your strength, mental as well as physical, and lose only when you have breathed your last. Because, trust me, if you follow this mantra, you will win. In a black and white scenario, if black stands for the negative and white for the positive, why focus on the black? Why not concentrate on the white? Whether the black portion of the scenario will loom large or the white one is not in your hands; but what you can control is where you want to look. So, till the moment the faintest patch of white is visible, look at it. Keep looking. Do not turn your gaze to the black portion. The major difference between people who surrender and people who fight is nothing but the scenario that they perceive in front of them. People who surrender see a challenge as an obstacle. People who fight see the same challenge as an opportunity. Yes, it takes time. Not not give up takes time. To keep fighting is even more difficult. Just like it was for the team of West Indies. But, wouldn’t it all be worth it if instead of surrendering and losing, you fight and lose? And who knows, you might even win! I mean, look at West Indies! And what if you lose? Well, at least you tried! Take a cue from England! Tere hi sapnon ki baarish hain! It is not because you woke up one morning and made an unwise decision of choosing a heartless person to give you heart to. Or because you are being punished or cursed by an unseen force. It is certainly not due to your dumbness, deafness or blindness! The answer is that you fell for the ‘wrong person’ because the last person you expected to be the ‘right one’ is (are you ready for it?) YOU! Now, this is not to say that every person you feel a connection with on Earth is wrong, stupid or undeserving of your love. The problem is not that you often give in a relationship more than you receive. This is merely an illusion. The actual problem, however lies in the fact that , as a human being, you tend to seek from others the things, feelings or desires which you never or seldom experienced. Topping the list of such things is LOVE. When one feels inadequate, neglected or unloved, s/he immediately sets out to find a companion to make these negative feelings disappear into thin air. Very often, one fails to understand that the ‘companion’ is as human as everyone else is, who might more or less have their own inadequacies or imperfections. Here is where one makes a huge mistake: One depends upon his/her companion to make their world better; when in reality, no one but they themselves can do that. When their expectations are not met, they begin to feel disconnected to their companion. In other words, they begin to feel that they have fallen for the wrong person. People, when they realize that they have fallen for the wrong person, tend to blame the person, their own fate or God. Some even start internalizing their disappointment. That’s the worst form of harm they can do to themselves. The fact is, no one but you can understand and heal yourself. You are your own God. You have the power to make or break yourself. People around you certainly contribute to your growth and development, but they don’t and can’t control your life. They have no power to hurt or heal you. It all starts and ends with you. Only by accepting yourself as you are and loving every bit of it, you will grow and you will heal. So, from today, in fact from this very moment, begin to love yourself. Little by little, step by step. Falter, and then improve. Try, and fail; try again, and fail a little less; try once more and see. Do whatever it takes, but keep loving yourself. Discover your identity. All of it. Enhance the best and discard the worst of it . It is hard and confusing and tedious. But it is worth the effort. It will give you the life you love and will help you to love happily. And then, I promise, you will never fall for the ‘WRONG PERSON’ again. The next three posts will be copy-pasted here from a blog titled, ‘AToZOfRandomStuff’. Now, I don’t plagiarize stuff from other blogs. But the above mentioned blog was mine. And fit to some reason, I cannot log in to it. So, I will be posting the older content here. Enjoy readers! Did You Know About The Origins Of Ring-A Ring-A Roses? Your childhood’s favourite rhyme has dark origins…. The ‘The Venice of Netherlands’ Is Sure To Bowl You Over With Its Beauty! 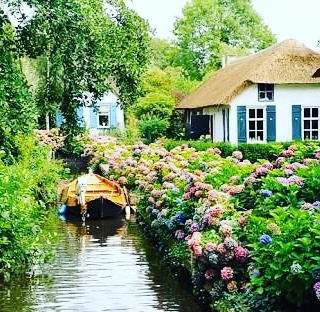 Giethoorn should be on every beauty lover’s travel list. Located in Netherlands, this quaint village has no roads at all! Click here to find out more about this heavenly destination! This is an excerpt from a poem I recently wrote. Enjoy! 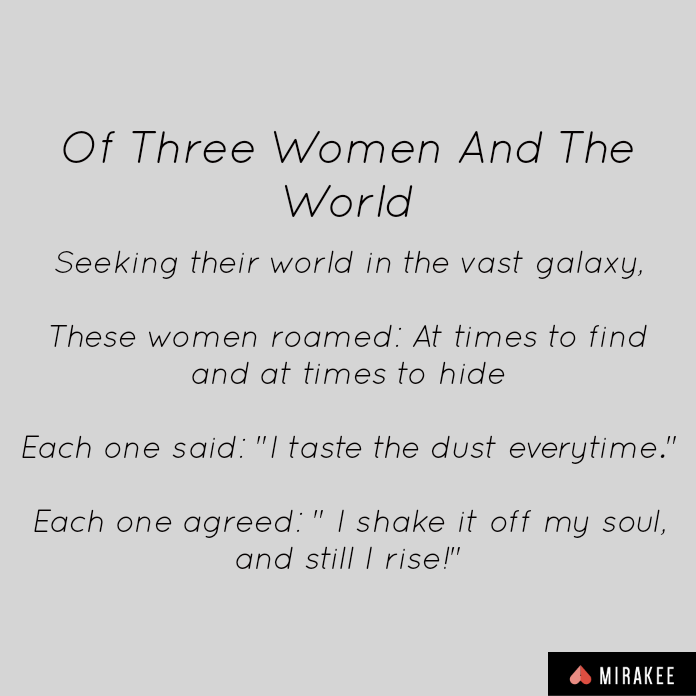 Posted by @anavidaddict on Mirakee app.